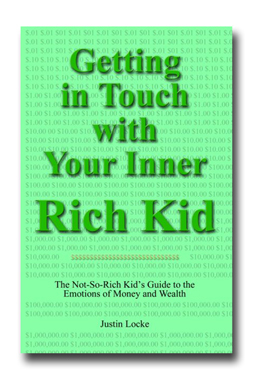 Well, it has been a couple of months since I published my new book, “Getting in Touch with Your Inner Rich Kid.” As is so often the case, after I write a book like this, I find myself “assimilating” the information and actually making ongoing new discoveries. One of the biggest epiphanies in the writing of the book was becoming aware of the extraordinary degree to which the feeling of trust figures into so much of our wealth consciousness, or lack thereof. At a recent talk, someone in the audience asked me, “how do you develop trust?” I had to defer to Gerald Weinberg, and say, “trust takes years to develop, and only a moment to lose.” This is the terrible nature of trust. It is essential, it is wonderful, but it is also terribly fragile. I think it is important to refer to the “poor kids/rich kid” lessons in my book and remember that the lack of trust always equates to the lack of wealth. Anyone who tells you to have less trust, even in someone else, is essentially impoverishing you. It’s important to remember that just as trust in others is fragile, our trust in ourselves (i.e., our confidence in our ability to make wise choices) is very fragile too. It’s very easy for political operatives to use vague insinuations, and make me question whether I should vote for either candidate. At that point, what happens? I may not vote at all, thinking that both candidates are charlatans. (I suspect that an awful lot of “poor kids” don’t vote, for the simple reason that their ability to trust anyone is so corrupted that they just give up.) Or worse I may lose all trust in civic institutions generally. Anyway, whether you have read my book or not, please do be aware of how the “sowing of mistrust” is being used as a form of propaganda. Statements like “my opponent is not trustworthy” are not really sound arguments for voting for someone. As they say, “the devil can quote scripture to suit his purpose,” and anyone’s past can be spun in a way to make them look like evil incarnate. The people who do this, do it because it works, unfortunately. They are seeking to use our own past trust violations to overcome our calm reflection. They are attempting to exploit our natural fragility of our trust energy, rather than making sound logical arguments and allowing us to make choices based on that information. For my own part, I’ve decided that people who emphasize mistrust are themselves de facto purveyors of poverty thinking, and further, if they are emphasizing mistrust of their opponents, it seems likely that this is because they don’t have something positive to say about themselves. Without endorsing any candidate, I urge you to become more conscious of this use of mistrust energy, and not automatically react to it or allow anyone to use it to get around your conscious mind.